I have a very special guest Meagen Eisenberg, who is the CMO of MongoDB. She has just done so many things in the B2B marketing world. We’ve been featuring guest experts on the sales side,so finally we’re going to spend a little time in the next couple episodes on the marketing side of the business and talk particularly to marketers that are embracing revenue responsibility, that are taking advantage of the opportunity from a cost center into a profit center. 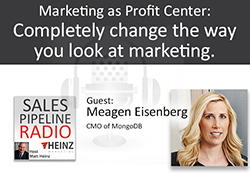 It’s so important in B2B marketing these days to make sure that what you’re doing is driving to business results,and I can’t think of a better person to feature than Meagen from MongoDB.